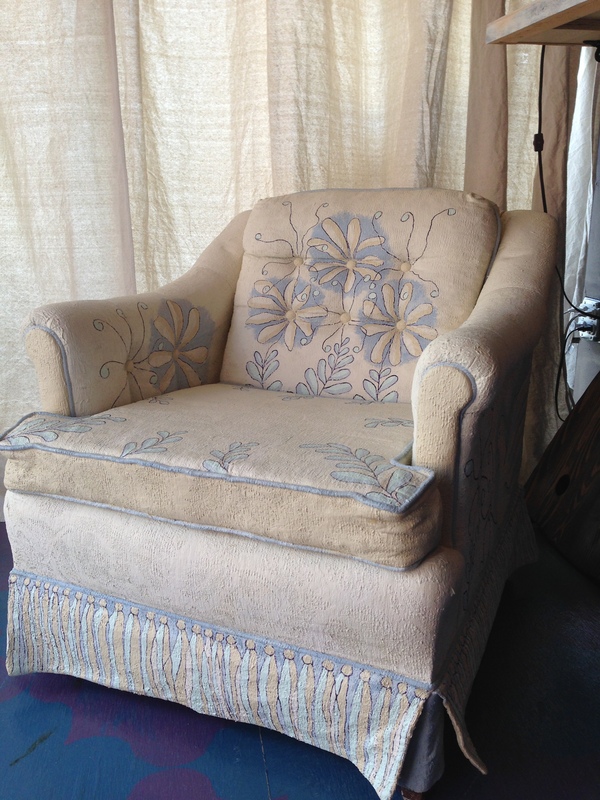 Here is the final installment about my art chair. If you are just finding this blog you can check out the beginning of this story here, here and here. I left off where I had just delivered my chair to the business that was hosting the event. I was worried that I the wax would cause more problems with the permanent marker I had used for the outlines. It would be several days before it would be on public display and I would be able to check on it. My extra paint was safely stashed away in case I had to do emergency repairs. What a relief to see that all was well with my chair. A few days later the store contacted me to see if I would be willing to do an interview about the event, my chair and the process. Yeah! I had a chance to go see my baby and see how she was doing. After a quick check, I was able to let out a sigh of relief that all was well. No more bleeds. 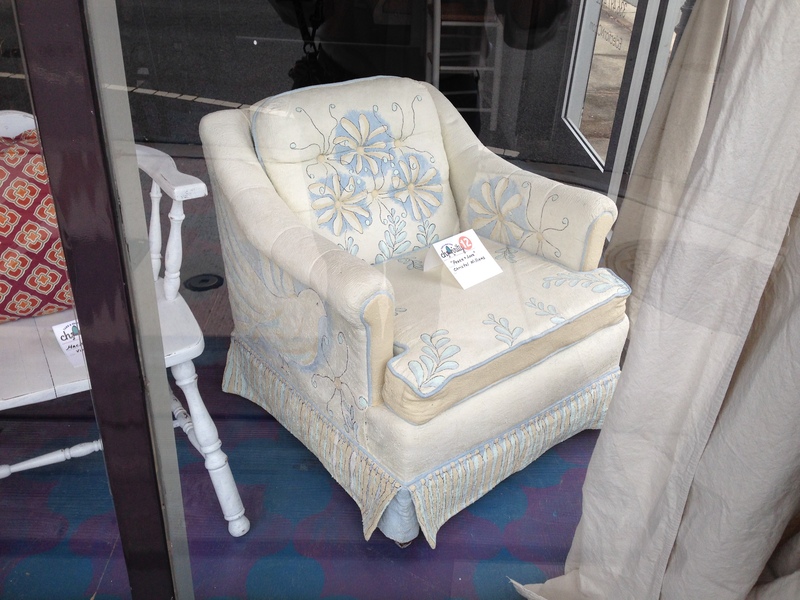 Here are a couple of photos of my chair on display. 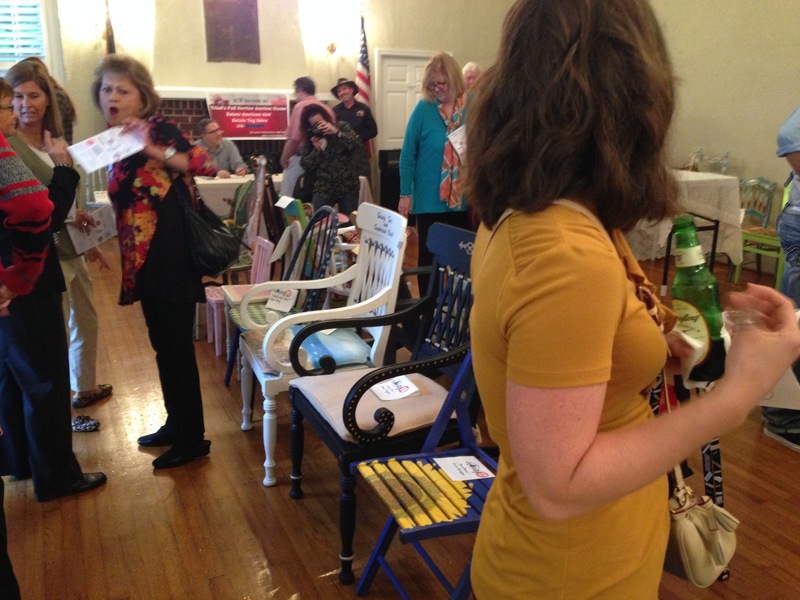 The chairs were divided among the downtown businesses for display for two weeks and people could see them and vote on their favorite. 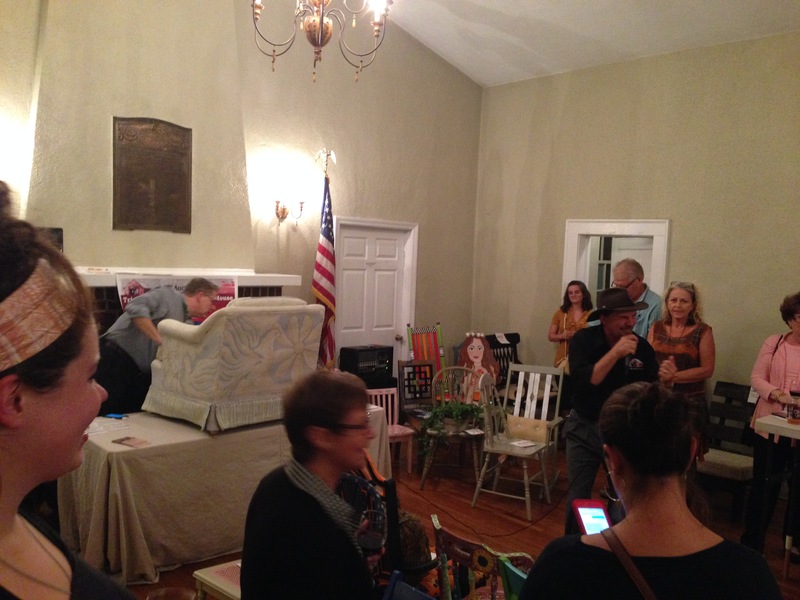 This past Saturday (September 26th) was the auction. I know several people involved with Next Step Ministries and they were concerned that enough tickets had not been sold. Add to that, the monsoon that had settled in over our town and there was the concern few people would come out in the rain. The fears were unfounded. We had a crowd turn out and the Community House was packed. Mine was the only upholstered chair submitted. I couldn’t decide if that was good or bad. It’s harder to drop an art chair of that size into just any space. The right person needed to have the right room for it. During the painting process I did not think to keep up with how much time it had taken me. I was too caught up in the creative moment(s). After I dropped off the chair I did a little math and estimate a minimum of 40 hours put in. Yikes! It never seemed like it took that long. Once I got started on it two or three hours would fly by without me having any idea. It’s that “flow” thing that happens when you are so involved in the concentration and process that time stands still. My baby on display at the auction. The other chairs on display. Yes, I was nervous when the bidding began. There was the fear that it would not do well. All that time put in and I was so afraid it would only bring $30! 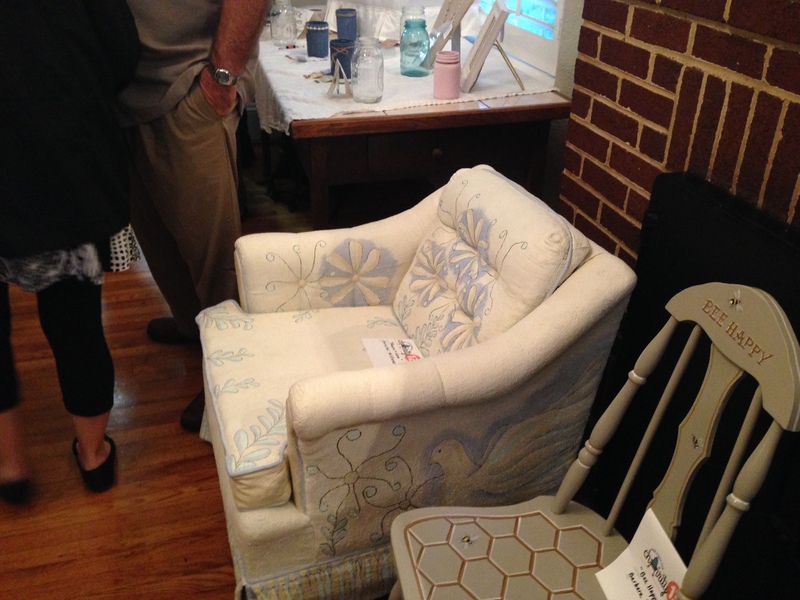 After a few minutes of intense bidding (partially by a couple of friends running up the price) my Doves & Daisies chair sold for $260. Whew! 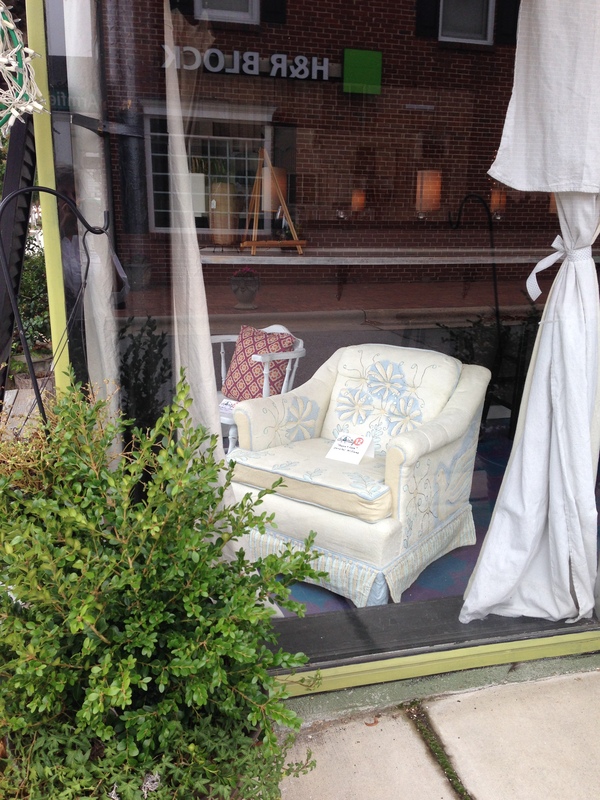 I wish I had gotten a picture of the lovely lady who bought my chair. She had not seen it until that night. She was a friend of one of the other artists and did not even realize that each side of the chair was painted until they put it on the table for the bidding to begin. She was still trying to decide where it was going to go in her house when I left her. Next Step Ministries was thrilled with the results of the evening. Since all thirty chairs and the food and drinks had been donated the total came in over $3000 funds raised for the shelter! Not bad at all for a first time event. I think there is the hope the event will become an annual occurrence now. Will I do it again? Absolutely. I enjoyed every minute of it (except maybe the retouching time). I went into it just hoping to bring in some money for one of my favorite local charities and move a chair out of my life and storage unit. I gained some new process knowledge and have now been contacted about painting a table and a chair for two other people. I will let you know how those pan out. Thus ends the “How To Paint a Chair” series. Have a great week!